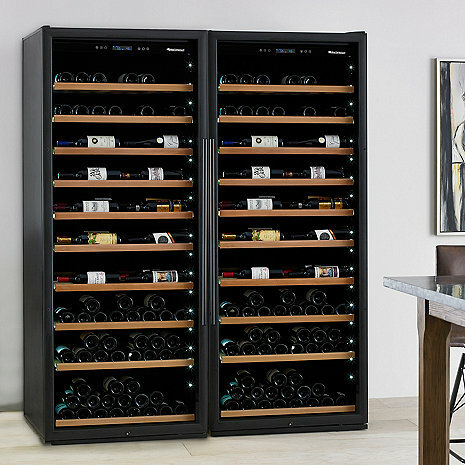 Classic VinoView 600-Bottle Wine Cellar offers the capacity of a small room cellar, handling 254 bottles with shelves in place, and up to 600 bottles with shelves taken out. Are the two units completely separate? IE separate temperatures and separate electrical connections? We want to separate the units by about 6 feet and have separate recepticals, just want to make sure we are recieving totally separate units. BEST ANSWER: identical and completely separable. they each have an internal control panel and separate power sources. Yes. The are two separate units. Power and all. Yes, they are completely separate. Can you attach the two units together? Hey Steve, there is not a way to attach these two units. As long as you take the time to level them you will never know! Cheers! Thanks Justin, how do you level the units? There is no way to physically connect the two units. They are heavy and can be pushed together. I only have 1 unit. I talked with the Wine Enthusiast consultant. BEST ANSWER: Can’t imagine why you would want your wines that cold. We keep around 56 degrees and it’s perfecr. I’ve never put below that so I can’t help you with this answer. Are the shelves "Pinot Noir/Chardonnay bottle friendly? I find many coolers are built for Bordeaux bottles only. BEST ANSWER: VonKrieger, Yes you can absolutely fit standard size Pinot/Chardonnay bottles in this cellar. Keep in mind that you might have some loss in capacity if you collection is primarily non-standard Bordeaux size bottles. Thanks! Just plugged it in for the first time. Lock symbol shows and can’t change any settings? BEST ANSWER: Push and hold the lock button for a few seconds. That will unlock the controls and then you can do stuff from there. Cheers! What parts would I need to replace the cooler in this unit? I have four identical units set side by side, so when the display window brightness is much dimmer on one unit than the other three it is very noticeable. How do I control the display brightness? The units are beautiful and quiet. With the Vino View shelving the capacity is NO where near 600 bottles as I have 500-550 bottles and had to continue to use my old (relocated) cellar for 80 or so bottle. Too many vino view shelves (10 in total) that reduce capacity by approximately 30% per shelf. I would prefer only 2 or 3 Vino Shelves per side instead of 5 as the capacity is closer to 475 bottles currently than 600 as configured, A great value and a great upgrade however and I would do it again! These systems are OK but don’t measure up to the price all the way around. They do not hold a constant temperature and I am already having trouble with digital displays after less than 6 months. The fact that the wine cellar is STILL not here. Originally due first week Dec, then before Christmas, then Jan 2, then two weeks ago, now next Tuesday. There was some glitch on delivery. Anyway, this has not been the best experience. Although, John Tucci was great.